How much would you pay for a cigar? How about for half a cigar (one that is already smoked)? I bet that if asked suddenly, the average person would say that thereâ€™s no way heâ€™d buy an already smoked cigar, at least off the top of his head. Then again, if you think about it, it depends on who smoked the cigar, right? Thatâ€™s exactly what happened with the remaining half of a cigar that Sir Winston Churchill smoked way back in 1941. 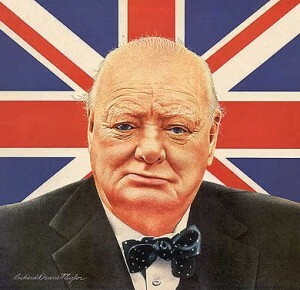 According to the â€œoriginalâ€ owner of the half-smoked cigar, Sir Winston Churchill was smoking the cigar when he was suddenly called to an urgent meeting with his cabinet. In response to the call, he tossed the cigar aside. A staff member then â€œrescuedâ€ the cigar and kept it as a souvenir. (I know I would probably have done the same thing if I were serving Sir Winston Churchill.) More than simply keeping the half-smoked cigar, however, the staff member decided to send it to a friend who then kept it well preserved to this day. Aside from the fact that the cigar was smoked by one of the greatest statesmen who ever lived, what makes the cigar special? For a selling price of $7000, it should be pretty special, shouldnâ€™t it? Well, among the thousands of cigars that Churchill smoked in his lifetime, this one has a personalized label with his name on it! Now I know why it sold for that muchâ€¦even though it is not â€œsmokableâ€ anymore.